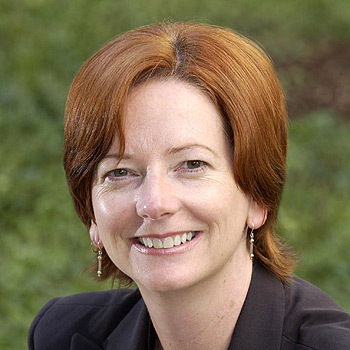 Australia has its first female Prime minister "Red Julia" Gillard. Often touted as a moderate, or even to the "right" by Australian Labor Party standards, she is unfortunately, anything but. Gillard is a member of the socialist Australian Fabian Society, joining through her membership in an even more left organization - a fact she has been very cagey about. In the run-up to the 2007 Australian elections, then ALP deputy leader Gillard was the centre of controversy, after then Federal Treasurer, Peter Costello exposed her past ties to to a Communist Party of Australia linked organisation, Socialist Forum. Initially Gillard admitted her association, but played it down. TONY JONES: Are you now or have you ever been a member of the Communist Party? JULIA GILLARD: (Laughs) Tony, I think that question shows how silly all of this is getting, though I suspect in this interview, probably the Howard Government would think you're the dangerous radical. After all, I'm only from the Labor Party, you're from the ABC. TONY JONES: Well look, seriously, Peter Costello has thrown this out. Let's deal with it properly. What's the Socialist Forum? Were you an organiser for it? And when did that happen, if you were? JULIA GILLARD: Tony, it's 2007 and I'm a 46-year-old woman. What Peter Costello is referring to is more than 20 years ago when I was in my 20s. I was a full-time university student and I had a part-time job for an organisation called Socialist Forum, which was a sort of debating society. It ultimately amalgamated with the Fabian society, which of course is a long-running ideas and debating group in Australian politics and indeed in British politics before Australian politics. I've worked in the cleric and administrative work. TONY JONES: It wasn't a front organisation for Communists? JULIA GILLARD: Certainly not. It was an organisation where people who identified themselves as progressives, some in the Labor Party, some outside the Labor Party, would come together and would talk about ideas. I did clerical and administrative work, Tony. This is so long ago. It's the days before modern computers and the internet, in the days where if you wanted to put out a meeting notice to people you wouldn't send an email, you'd get out an envelope and put it in your IBM electric typewriter and type up the address and then get the next one. That's the sort of thing I used to do. Scrapping the ANZUS treaty, twinning Melbourne with Leningrad and introducing a super-tax on the rich were among radical policies devised or backed by Julia Gillard as a student activist. Labor's deputy leader was a key figure in a socialist group that pushed radical policies and social agendas in the 1980s and early '90s. Founded in 1984 as a pressure group within the ALP, the Socialist Forum also wanted to sever Australia's alliance with the US, remove the spy base at Pine Gap, introduce death duties and redistribute wealth from the rich to the poor. The Sunday Herald Sun has gained access to the forum's archive – held in the Baillieu Library at the University of Melbourne. The archive contains material revealing the radical past of Ms Gillard, including her links to former members of the Communist Party of Australia. Ms Gillard, who could be Australia's next deputy prime minister, was on the management committee of the forum for many years. She acted as its public officer, secretary, and legal adviser on the drafting of its constitution. Her signature is on liquor licence applications for the forum's social events, such as theatre nights. In a pamphlet from the mid-1980s, Ms Gillard describes herself as a "socialist and a feminist" and someone who joined the ALP at 16. "Contrary to what may have been suggested, Socialist Forum is not a secret organisation nor is it a sub-caucus with the Socialist Left," Ms Gillard says in the pamphlet. "The members of the forum are drawn from varied backgrounds. Around 45 of the forum's members left the Communist Party of Australia in the division of a year ago and about 80 are members of the ALP. The largest group are not members of any political party." The 200-plus member forum sought to influence Bob Hawke's Labor government, especially on foreign and economic policy, through the free discussion of ideas. One key document is the 1985 "Pine Gap - Planning a Strategy", drafted by Philip Hind, who recommends a long-term policy of abrogating the ANZUS Treaty, removing Pine Gap and eventually closing all US bases. Mr Hind visited the former Soviet Union and came back praising the reforms of president Mikhail Gorbachev. He recommended stronger ties with the USSR, including making Melbourne a sister city of Leningrad (now St Petersburg). The archive also reveals the forum's debate over tax policy was based on a Communist Party tax pamphlet titled "A Case for Radical Tax Reform". "We argue that there is only one effective way to reform the tax system, by a sweeping redistribution of the tax burden which now hits hardest at low and middle-income earners," the pamphlet says. In reality Socialist Forum was almost wholly a vehicle for former leaders of the Communist Party. I quote Australian Marxist-Leninist paper Green Left Weekly from an article from 30th November 1994 on late Communist Party of Australia leader Bernie Taft. The end was in sight by the early '80s, and Taft, most of the Victorian leadership and a quarter of the CPA National Committee departed to form Socialist Forum, an ALP ginger group. Social Action Australia, claims that Socialist Forum was, not a split in the Communist Party, but a deliberate communist attempt to infiltrate the ALP, in response to Catholic aligned Labor "rightists" moving back into the party. Left-wing acquiescence for the re-entry of the Grouper unions into the ALP in 1984 resulted in the Victorian branch of the CPA being allowed to enter the ALP en masse and consequently to form an inner party organisation called ‘Socialist Forum’. This organisation was led by the former communist Victorian leader, Bernie Taft, who had adhered to the strategy formulated by the influential Italian Marxist theorist Antonio Gramasci. Gramasci’s strategy envisaged that power transformation could be facilitated through communists gaining control of the levers of power: i.e. Marxist infiltration of trade unions, educational facilities, cultural associations and political parties. Gillard came semi-clean about her long term involvement in Socialist Forum in a 23rd October interview with Melbourne radio station 3AW, now unfortunately scrubbed. NEIL MITCHELL: When would you last have gone to a meeting? NEIL MITCHELL: So were you on the Management Committee until 1994 at least? JULIA GILLARD: I would’ve been. I mean, certainly the records show that I would’ve stayed on the management committee. But Neil, this is a voluntary organisation; a couple of hundred members. Once you’re on the management committee of something like that it can be hard to get off because no one wants to step up and take your place! NEIL MITCHELL: Did you ever resign? Did you ever resign from the Socialist Forum? NEIL MITCHELL: Well, it sort of became the Fabian Society, didn’t it? JULIA GILLARD: …people who want to join that sort of thing join the Fabian Society. NEIL MITCHELL: So are you a member of the Fabian Society? JULIA GILLARD: Yes I am. NEIL MITCHELL: And what, you just sort of went from Socialist Forum to Fabian Society? JULIA GILLARD: I hold a membership of the Fabian Society, I do support people getting together and talking about ideas. I think that’s all to the good. JULIA GILLARD: They generously invited me to address their recent dinner which I did. The parliamentary register of interests states that Julia Gillard remained a member of Socialist Forum from 1998-2002, after which the group merged with the Fabian Society. Interesting backgrounder. Incidentally, the final link is broken. Thank you for exposing our first female Prime Minister! In case you missed it, she's our first female Prime Minister! Already our media are in love with "Red Joooowyaa", and think she'll be a big departure from Little Kev! No, she ain't!! She is our first female PM though, in case you missed it! What I find interesting is, every time these bolsheviks are exposed, they deny what they are. Marx & Engels were quite proud of themselves. These situations remind me of the movie, "mars attacks", the martians have language translaters saying "don't run, we come in peace, we're your friends," whilst they burn down everyone and everything in sight, while everyone in the "intelligencia", supports, ignors, or give them the benefit of the doubt. The are some bloggers who are talking about Hillary becaming President in the US. Yes, the Marxists are a bunch of liers and call themselves "Progressive". God help Australia from this red Kangaroo! So Australia has a Fabian Socialist running their government? LOVELY. God help ANZAC. Glenn Beck said to read your blog everyday, which I shall. Keep it up- and don't stop. I tried to share this on my Facebook but couldn't get it to work. Anyone else having trouble?